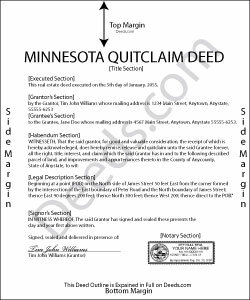 The quitclaim deed from individual to individual (Minnesota Conveyancing Blanks Form 10.3.1) is "sufficient to pass all the estate which the grantor could convey by deed of bargain and sale" in Minnesota (Minn. Stat. 507.06). The deed conveys to the named grantee "all right, title, and interest of the grantor in the premises described," and does not extend to any after-acquired title ( 507.07). A quitclaim deed contains no warranties of title. For this reason, the quitclaim deed is often used in divorce or other transactions between family members. Requirements of the form include the names and marital status of each grantor and grantee and a complete legal description of the property subject to transfer. All grantors or grantors' authorized representatives and joining spouses must sign the deed. A state deed tax, the amount of which is cited on the face of the deed is levied on the amount of consideration made for the transfer, and must be paid before the deed can be recorded. Minnesota requires an electronic certificate of real estate value and a well disclosure statement for all sales of real property. Ensure the deed meets document recording standards ( 507.093) before submitting to the recorder's office (or registrar's office, for Torrens land). Consult a lawyer with any questions related to quitclaim deeds or other real property transfers. Yvonne W. said: I'm not certain yet that this is all I need to do what I need to do. Marion Co. Clerk's office has not been helpful. I found this site from that site & hopefully it will help. Reply from Staff: Thanks for the feedback Yvonne. We hope you found what you needed. Have a wonderful day!